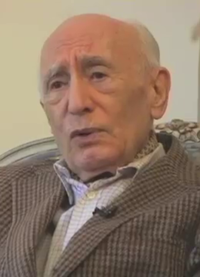 Ehsan Yarshater (Persian: احسان يارشاطر‎, April 3, 1920 – September 1, 2018) was an Iranian historian and linguist. He worked in iranology. He was the founder and director of The Center for Iranian Studies, and Hagop Kevorkian Professor Emeritus of Iranian Studies at Columbia University. ↑ Alavi, Hamid (September 2, 2018). "درگذشت احسان یارشاطر؛ مردی که زبان فارسی وطنش بود" (in Persian). BBC Persian. Retrieved September 2, 2018.